If a visitor visits our site to browse or to read or download information. We use this information to measure the number of visitors to the different pages of our site, when visitors access the site, how long they stay connected to the site, and the domain and host from which visitors come to visit our site. We use this information in turn to assess the interest or lack of interest of visitors in the various pages of the site in order to help us make our site more useful, and to assess our marketing efforts. We have no set period after which we delete this information. We may also run display ads on third-party web sites. If a person clicks on one of our ads, Google or Bing will set an advertising cookie (including the DoubleClick cookie) and/or an anonymous identifier. A "cookie" is a file that a web site can place on your computer's hard drive in order, for example, to collect information about your preferences or activities. The cookie transmits this information back to the web site's server. An "anonymous identifier" is a random string of characters that is used for the same purposes as a cookie on platforms, including certain mobile devices, where cookie technology is not available. To learn more about cookies, including the DoubleClick cookie, read this. The Google Display Advertiser Features we use include Demographics and Interest reporting, Remarketing, Google Display Network (GDN) Impression Reporting, the DoubleClick Campaign Manager, and enhanced link attribution. We use these features to collect information on the gender, age, and general "interests" of the people who clicked on the ad, to the extent such information is available. The type of "interests" data we receive is that the person clicking on the ad is interested in, for example, movies, travel, news, outdoors, etc. We do not pair any gender, age, or interest data with any particular person. So, for example, if Alex Smith clicks on a display ad, is taken to our web site, and then completes a request for information, we will not know anything about Alex's gender (other than what a name may imply), age, or interests. The information we will receive is anonymous and aggregated. In other words, the information would be that a certain percent of the people who clicked on an ad were male/female, in a particular age range, and had an interest, for example, in movies, travel, news, outdoors, etc. We use this information to develop a profile of people interested in our summer camp so that we can locate third party web sites on which to advertise who attract people who fit this profile. We have no set period after which we delete this information. Enhanced link attribution simply allows us to better track the use of all the links on a page on our web site. We do not use "cookies" to track your web surfing anywhere other than on this web site. If you do not want to share this data with Google, you have several options for opting out of interest-based ads. First, you can opt out of interest-based ads by Google through Google's Ads Settings. To learn about where your opt outs will apply, how to opt out, and what opting out does and doesn't do, read this. Second, Google has developed a Google Analytics opt-out browser add-on tool that you can download for free and install on your browser (Chrome, Internet Explorer 8+, Safari, Firefox, and Opera). To read more and download the tool, click here. And third, you can use the interest-based ads opt-out tool developed by the Network Advertising Initiative (NAI). You can read more by clicking here. If a visitor completes an information request on our web site or sends us an email. We collect personally identifying information from people communicating with us. This information includes name, address, email address, and telephone number. We also collect the name, age, and gender of potential campers and any interests expressed, including but not limited to, activities, food, transportation, and roommate requests. This information is collected directly from the person contacting us, and only to the extent the person volunteers that information. The information provided is up to the person contacting us. 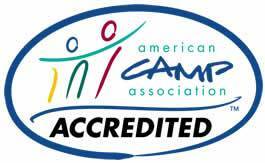 We use this information for marketing camp (individually or in conjunction with other camps through a trade association) to the potential camper and his/her parents, and to track interests so that we may improve our services. We will not otherwise share information collected by the website or by email with other people, unless the collection, use, or dissemination of such information is necessary (i) to protect the security or integrity of our website; (ii) to take precautions against liability; (iii) to respond to judicial process; or (iv) to the extent permitted under other provisions of law, to provide information to law enforcement agencies or for an investigation on a matter related to public safety. If a visitor clicks on a link to another website. If a parent/camper responds to an online evaluation of the camper's camping experience. We intend to send an email to all campers and their parents at summer's end inviting them to complete an online evaluation of the camper's experience. Such information will include ranking the camper's favorite activities, suggestions for new programs and improvements, rating our food, accommodations, and facilities, whether the camper enjoyed and benefited from his/her counselor, what the camper's favorite part of Camp was and why, whether the Camp was successful in its goals such as encouraging the camper to have at least one new experience, to acquire at least one new skill, to make at least one new friend, to ascertain whether Camp-parent communications were adequate, solicit any health or safety concerns, why they chose Shaffer's High Sierra Camp, if they plan on sending the camper back to Camp the following summer, any suggestions for improving the Camp, and whether they would be willing to be listed as a reference. Providing this information and name is optional. If you are a parent of a potential camper, here is some information you need to know. Under the Children's Online Privacy Protection Act ("COPPA"), an operator of a commercial website or online service directed to children 12 years of age or younger is required to obtain verifiable parental consent to collect, use, or disclose personal information of a child. There are certain limited exceptions allowing operators to collect a child's email address without prior parental consent, including but not limited to, collecting a child's or parent's email address to provide notice and to seek consent, and collecting an email address to respond to a one-time request from a child and then deleting it. As noted above, we wish to obtain the types of information identified above from those people, including children, who visit our website. If you want to get information about you or your child that may be in our records. You may: (1) telephone us at (415) 897-0316; or (2) send a written request by fax or mail to the contact identified below. You must provide sufficient information to verify your identity, and, if you make a written request, your telephone number and address. Mail: Shaffer's High Sierra Camp, Inc. If you experience technical problems with the operation of the web site, please contact us. Here's what you should know about the security of information you provide to us. We utilize online services provided by MailChimp.com to collect the data you provide when requesting information and by CampMinder, LLC and when registering online. We use MailChimp to collect the basic contact information (name and email address) you provide to us for marketing purposes and copies of email correspondence. We may also notate any interaction such as by phone or email we have with you. The information residing on MailChimp servers is protected by multiple layers of security. We do not store any financial data on MailChimp.com. You may read about MailChimp's security here. The Camp uses CampMinder to collect and store personally identifiable information about you and your campers, financial information, program scheduling for your camper, and transportation details. CampMinder also uses various layers of security. The Camp and these vendors hold your information in the strictest of confidence. For more information on MailChimp, see MailChimp.com. For more information on CampMinder, see CampMinder.com) or contact them: CampMinder, LLC, 2456 8th Street, Boulder, Colorado 80304. Phone: (303) 731-2804. Email to and from us may reside on an online server. If you send us an email, you should know that email is not necessarily secure against interception. So, if your communication includes sensitive information like your bank account, credit card, etc., contact us by telephone or postal mail rather than email.